We’re taught to share at a young age. Kids who hoard their favorite toys are typically reprimanded and told to be less selfish. “Plays well with others” is an encouraging sign on a report card. Sadly, this cooperative spirit fell by the wayside when we created marketing agencies. People suddenly became overprotective of their team members, processes, ideas, and expertise. Agencies do it in the name of self-preservation, but this hoarding mentality causes them to stagnate by only sticking to what they already know. In the end, it’s a loss for clients. We need to return to a mentality of collaboration and transparency, even if it means feeling vulnerable. It’s admittedly a tough sell. Giving up a sense of self-preservation and putting all your cards on the table can create anxiety among those accustomed to stifled innovation and “only invented here” syndrome. When you’ve found something that resonates with consumers, the last thing you probably want to do is share your secrets with competitors. Opening the door to collaborative discussions with partner agencies takes more than a modicum of trust and faith. If you’re so worried about your own offerings that you don’t consider industry innovations, you’ll ultimately fail to deliver. Your agency—and your clients—will miss the amazing stuff that’s out there. Every company is ultimately trying to sell a product or service to customers. The company’s marketing and sales teams make sure there’s a population that will buy the organization’s wares, and an agency’s job is to help the company reach that audience. We tend to be protective of our ideas because they feel like the only thing that differentiates us from competitors. That’s not to say you should give away trade secrets—what would KFC Corporation be without Colonel Sanders’ original recipe?—but we need to move away from the mindset of “I have this idea for my client, and nobody else can have it.” It’s limiting, and it damages everyone involved. When companies share ideas, they boost their natural abilities. There’s no need to reinvent the wheel when a dozen other organizations have already solved a problem. Monsanto and American Express might seem about as different as you can get, but they ended up learning a lot from each other. Our agency fostered a partnership between the two companies by helping them connect the dots on customer relationship management protocols. They ended up uncovering synergies through sharing. While they avoided disclosing any confidential secrets or customer information, this collaboration gave the companies a rare and exciting opportunity to freely engage in problem-solving that benefitted their customers. Their employees realized Monsanto and American Express had vastly different clientele, but their CRM models dovetailed in a beautiful way. The organizations walked away from the partnership stronger than before they went into it. To reach this kind of epiphany, we need to stop the car, put it in reverse, and open our eyes to the benefits of transparent communication. Here are four steps to move you toward the promised land. A team of people deeply immersed in its clients’ business tends to put on blinders and forge ahead without looking backward or sideways. 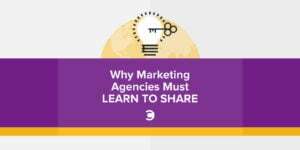 They might not even notice the same issues exist for other clients within their own agency. As leaders, we need to make sure there’s always a “bigger picture” perspective at work. Goals, values, and strategies can only be aligned when team members have freedom to cooperate and communicate. Brainstorm sessions; planned meetings; chance discussions. These are times ripe for cross-pollination. People don’t need to be experts on a given topic to add value to a problem-solving venture. Silicon Valley provides a fabulous example of the power of cross-pollination. Because of its geography and the way companies are laid out next to each other, formal and informal powwows are relatively commonplace. Our perspective tends to get skewed when we operate in a bubble. Popping that bubble through cross-pollination allows us to get talented thinkers and creatives together to come up with novel solutions. Every agency gets stale—especially if it’s not actively seeking new ideas. At Sandbox, we frequently ask people who have nothing to do with a client to help solve various problems. We bring them into sessions and pick their brains for fresh perspectives based on their specific skill sets. This feedback helps us understand our options and keeps us from allowing complacency and shortsightedness from taking hold. We might have never realized the benefit of introducing Monsanto and American Express had we not asked a team member with CRM expertise to help brainstorm ideas. Find a way to share an open forum so people feel free to look, observe, and chime in. As I walk around our agency, I inevitably see other people’s work. Instead of sequestering that work to their own team, they should be encouraged to share it. Isolating people and thoughts is a terrible strategy for building a successful agency. Reward and inspire collaboration, and you could see your team efficiency improve by 20 percent. Self-preservation is understandable in the marketing world, but it’s no way to run an agency. Your clients will eventually find other innovative ideas in the world and wonder why they’ve missed out because of your narrow worldview. Drop the elitist attitude, and reach out to your industry colleagues for a little collaboration—you’ll look better, and it will help you put together programs your clients will appreciate. You might discover sharing as an adult is way more profitable than it was when you were a kid. Joe Kuchta is chief client officer with Sandbox, an independent marketing agency with offices in Chicago, Kansas City, New York, and Toronto. He previously served as CEO of GA Communication Group, one of four founding members of Sandbox.